Contemporary: To reveal, to clarify, to find the truth. To provide a portal for personal growth. We are an independent video company in Texas. We work in HD almost exclusively. Our stories are chosen with an eye for the message as well as the image. The central philosophy of Aperio Productions work is to first serve those sharing their story, next serve the viewer and finally serve ourselves. The Ripple Effect takes the viewer on an emotional, spiritual, and life changing journey to Egypt, where awe inspiring ancient wonders, along with the power of sound and ceremony, challenge the viewer's senses with new and unusual images, sounds and experiences. 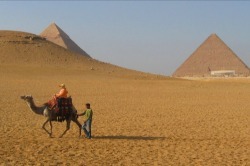 We join a group of modern day pilgrims as they visit the most sacred sites in Egypt. Through sound activation in powerful tribal ceremonies, each adventurer learns to connect with himself and in turn, with others.